Our Add-A-Pockets are your link to organization. Made from silver nylon mesh, these pockets are exceptionally durable and hook together with grommet & latch hardware. They're just the thing for collecting and sorting papers, mail, folders, magazines or small toys. Hang them on an overdoor hook (included) or a Professional Picture Hanger (shown, listed below). Add-A-Pocket is rated 4.2 out of 5 by 26. Rated 3 out of 5 by CarrieS from Amazing overall, needs improvement though Overall these are so wonderful. We have extremely limited storage space so these are a lifesaver to hang over the door to store things. We have a lot of them. However, if you plan to hang more than one set together (which they are seemingly designed to do), be prepared for them to come apart often. It just takes opening the door a little too quickly or bumping into one to knock them off. I plan to stitch them together to hopefully solve this, but I feel like the manufacturer could address this to make a better product. If it wasn't for them popping off occasionally, they would be perfect!! Rated 4 out of 5 by clutter from Sturdy and visable I hung these on my son's dresser with the command hooks. I like how they are see through and sturdy. Didn't connect them as I wanted them separate so I can just grab and go. Wished the hook hole was a little bigger but I understand it's because of the clasp. Rated 5 out of 5 by MiddleNameOrganized from Great For Pooches! Kept in the mudroom for the dog's use they hold leashes, pet wipes, clippers, anything you can imagine and boom it's there at your fingertips! This was a great find! Haven't seen anything like this anywhere else. LOVE The Container Store! Rated 4 out of 5 by bumblebeefl from Okay This product is okay. It is serving its purpose for me, but I'm not sure it was the best choice for my family. We are using it to hold dusting tools in the closet. Rated 4 out of 5 by orgdiva from great as a door basket I hung one of these on the back of my foyer door handle for things that need to go out the next day (return movies, library books, etc.). The only negative is that when these were purchased, the ring at the top of the pocket that keeps it nice and open is not round as shown in the picture; all of the ones that were available in my store were out of shape so I am spending some time trying to bend it back into a nice shape. Otherwise perfect for what I needed it for. Rated 4 out of 5 by texasmommy10 from Good as a Catch All I originally saw these on Pinterest. We needed organization in the entry way. These have worked perfectly, I bought 2. They have held quite a bit without any sign of giving way. Believe me, my family has tested them...short of climbing in. Rated 5 out of 5 by Shopper96 from AWESOME Veggie Organizer I have been looking for some sort of system to put my potatoes and onions in and this works GREAT! 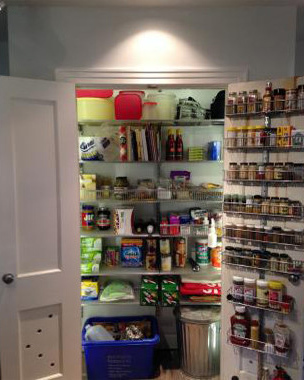 I hung it on the inside of my pantry door, got the potatoes and onions off the floor in the pantry! Rated 5 out of 5 by Raleigh from Very handy for organizing plastic bags I put this in my laundry room to hold different sizes of the plastic bags I get when I shop at department stores, etc. Works well! Rated 5 out of 5 by Cathycab from Excellent for storing hats/gloves/etc. I hung these on the wall of my mud room to store my kids gloves/hats/balaklavas and it works very well. Haven't seen anything else like it. Rated 4 out of 5 by bellaa from Great, but they don't always hold their shape I got these to hang in our laundry room for dirty kitchen towels waiting to be washed. It works great for that purpose. My only complaint is that the pockets get bent out of shape quite easily -- they don't always stay open in a circular shape, sometimes they get squished and then they don't look as nice. I think part of this is how they are packaged (flattened). We like them, though, for what we're using them for. They could probably be improved to hold their shape better. Rated 4 out of 5 by cchu04 from Useful orgnazier I have this hanging at my front door for me to drop of keys, mail, etc. The only thing I don't like is it stays out/open and sometimes I wish it would squeeze back in. Rated 3 out of 5 by RobinC from Works fine over the door We have ours hanging over the door (in daughter's closet); however, it's not been filled yet. Not sure if it will stay in that location. (Just bought her more storage/organization shelves/cubes, ect for her closet, so her room is still in the process of being organized.) It does look nice (as far as organization/storage uses), but I'm just not sure of my exact use for it yet. Not a bad product, by no means, as long as you have a use for it. Not sure it looks nice enough to hang on the wall, though. Rated 5 out of 5 by organized50 from I was looking for a non traditional plastic bag holder for the garage, this works perfect. I hung it from a magazine rack I purchased here to hold all my paper bags. I know it is just the garage, but I think it looks great! Rated 1 out of 5 by Organizized from Warped? The multiple positive reviews convinced me to order this--it's a great cocncept. But the quality/workmanship isn't good--it seems that the bands around the tops of the bags (a plastic insert?) are warped. It's not possible to reshape them. so if I were to hang this on the door the pockets would stick out oddly. Maybe I got a bad one. I'm going to return this and also request compensation for return shipping. Rated 4 out of 5 by jvcontainer from A near miss for recycling use I purchased this to use for recycling. It does everything it says, and is made well, but has a couple of drawbacks when used for recycling: the bags are a little too small, and the top one hangs right near the top of the door, which is hard for some family members to reach. Also, it's not quite easy enough to detach and empty the bags. Overall, we will try to make it work by adding two more to the "stack" that hangs over the door. But it would be better if the bags were a little wider (left to right) and taller - but not deeper (front to back) as they need to tuck in between the door and the wall when the door is opened. Rated 4 out of 5 by Getitoffthefloor from Cute idea for storage I decided to hang this in my pantry to hold chips/snacks and lightweight goodies that I want to keep out of the hands of my toddler. It's cute - I really like the way the two baskets fasten together and it looks nice hanging on the wall - def not an eye sore. Rated 5 out of 5 by sanfernCSfan from stylish useful looks great against blue painted laundry wall. Easy as hanging a picture - nail, hook, done. Use for rags and odd socks. Rated 5 out of 5 by Susan from Answer to a Coat Closet Delimma Excellent for storing hats, gloves, scarves on the door of the coat closet. Rated 5 out of 5 by SuperOrganizer1025 from Space Saver! I used these pockets with smaller ones I bought from the Container Store a few years back. Although the product description says to use them with books, magazines, etc... I used them in my bathroom to hold my blowdryer, straightening iron, elastics, hair clips, etc. They are perfect for holding everyday items and match my bathroom decor! I may go and buy 2 more! Rated 4 out of 5 by AJA1 from Closeted Work well to keep my gym clothes in order and away from my other clothes. Stuck a few removable hooks to the wall and was set: 1 for sweatpants, 1 for T-shirts, 1 for shorts, etc. Rated 5 out of 5 by Karina from Best Purchase ever Absolutely love these!!! They are very light and you can install them anywhere. We use ours in the laundry room to hold homework and books that belong to the library. They are very durable and easy to install. They are a generous size so you can put almost anything in them and because they are mesh you can still see the contents making it easy to remember that something is there waiting to be used/returned/etc. Great product!!! Yes! they come with an over-the-door hook, or you can use a picture-hanger, a nail, or even a command hook.